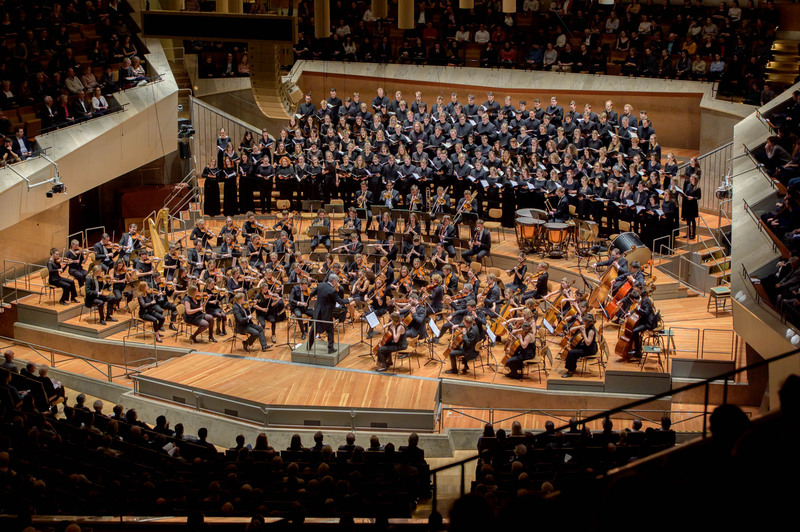 On 13 January 2019, the choir of the Freiburg Hochschule for Music performed for the first time in the Berlin Philharmonie. The hall was completely sold out for the program, which included Tchaikovsky’s “Romeo and Juliet Overture”, the Brahms “Schicksalslied”, Schumann’s “Requiem für Mignon”, and Stravinsky’s “Symphony of Psalms”. The honorary patron of the event, Elke Büdenbender – wife of Germany’s President Frank Walter Steinmeier – was present as the 80 students from Freiburg performed with more than 140 other young musicians including the EuropaChor, the choir of the St. Petersburg Conservatory, and the Symphony Orchestra of Junges Ensemble Berlin. The program was conducted by Michael Riedel and Prof. Frank Markowitsch.